The lines and the water speed will be subject to some variation in the transition from plan to production, depending on the choice of materials and the owner’s requirements. The design is adaptable to hull construction of heavy or light metals, to the newer molded wood products, or to combinations. Original plans are for a 34-foot craft, sleeping six people. A second model, 28 feet long, sleeping four, will follow soon. The experience both of yacht and trailer builders has been called on in fitting the necessities for comfortable living into limited space. and handy storage, space for sports gear and marine equipment. It is converted into a fishing cockpit afloat by moving certain sections of the seats out to form fishing chairs and rolling down the Plexiglas “ports” or windows. Forward of this compartment is the main living salon, complete with lounge, cushions, bookcases and a built-in television set. The lounge pulls outward slightly to form a full-width single bunk and the panelling opposite lowers to form another bunk. On the starboard side forward of the main living salon, a dining alcove has an arrangement of movable seats and table top that permits this space to be used as an enlargement of the living room between meals. At meal time the seats are moved and the table top swings into place to reveal heated receivers for four special food containers from the galley, so that the meal can be kept hot to the last morsel. At night the versatile table top and seats are swung into a third position to provide a double bed of the pullman type. Opposite the dining alcove the compact galley consists of six units, all within easy reach of the housekeeper’s hands. Sink and dishwasher are in the center. Aft, against the bulkhead, is a frozen food container and refrigerator. On the right is an electric range and broiler. Behind this is a four-unit pyrex set in which foods are cooked and then transferred in the same containers to the heated reservoirs set into the top of the dining table. Forward of the galley and dining alcove the division of living quarters from driving compartment is accomplished by splitting the bath and toilet into two units, one on each side, leaving central aisle space wide enough for easy passage back and forth but narrow enough for screening when night driving requires safe darkness in the driving compartment while passengers aft enjoy as much light as they want. For the owner who wants a paid chauffeur-pilot a bunk can be built into the driving compartment. The bath and shower unit is on the port side, complete even to a shower seat over the wheel housing. Toilet and wash basin are in the companion enclosure across the passageway. The vehicle is air-conditioned. When “raw” air is wanted the wide Plexiglas ports lower automatically. Tire inflation is automatic, too, effected from the driver’s seat in a peacetime application of an important war development which made it possible for many amphibians to scale steep beach slopes. For full privacy at night the designer has developed a new close-sealing interlocking metal blind. The cruiser carries an adequate complement of legal highway and marine lights. Internal lighting is featured by one of the “slimline” fluorescents to give a single overall line of light down the center when the wall brackets are not wanted. An incidental lighting detail is the use of the new “circline” fluorescent lamp recessed around the shaving and makeup mirror in the washroom. Designer Zeidman has an impressive list of product design achievements to his credit. His interest in amphibious craft came out of wartime service. For the Army he built models of practically every tank and vehicle in the world. 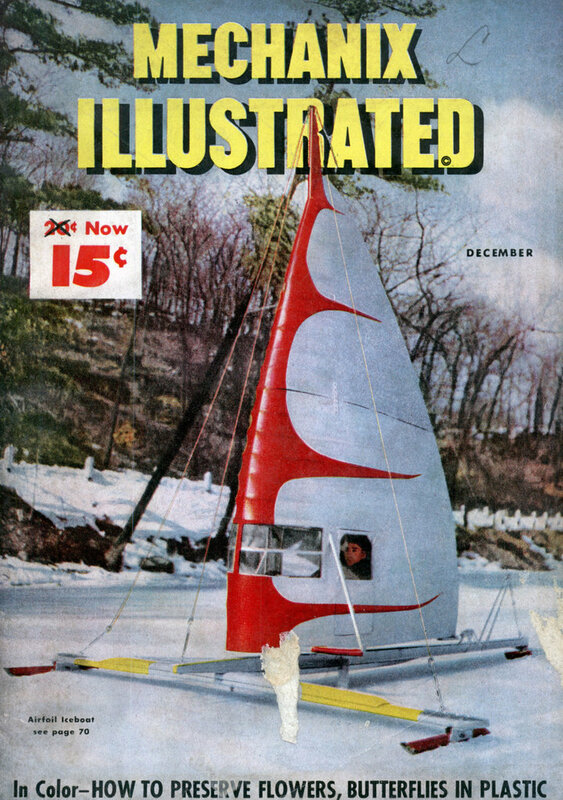 The “Vacationer” cannot be a low-cost mass-produced vehicle, but upkeep costs per hour will compare favorably with those of typical 35-foot cabin cruisers for the time actually in the water. Zeidman says his amphibian can be Quonset-parked or otherwise cheaply housed on the owner’s property. The new construction materials avoid the bugaboos of corrosion and costly hull maintenance. The available vacation range of the owner of this craft would be much greater than that of the water-bound yachtsman, yet the amphibious features provide all the use of water that the fisherman or boating enthusiast can wish. The good road speed was specified in the expectation that owners will do their travelling on land and their relaxation afloat. I want one! 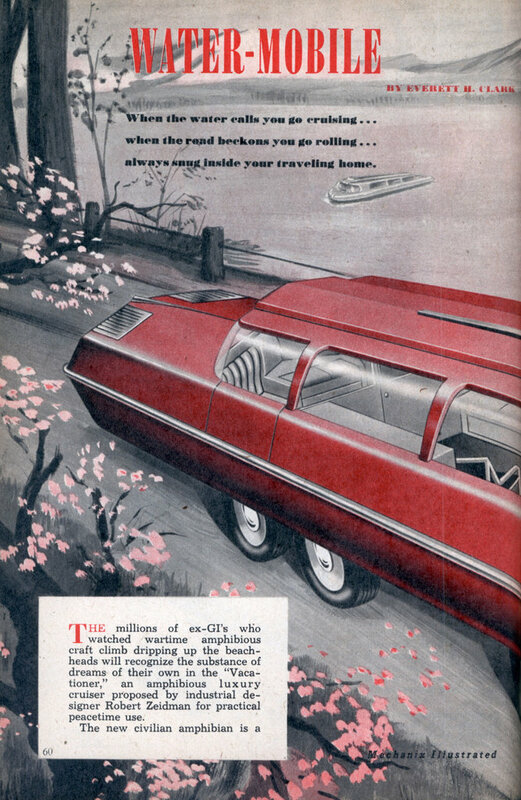 Motorhomes were a rarity in 1947, as were televisions, and (outside of military applications), amphibious vehicles. This gives you three-in-one! It’s like a Snow Cruiser for everyone! That would be a cool looking vehicle today, made from lighter materials and maybe a diesel driven electric drive system it would be pretty efficient too. That’s my kind of hybrid!! Reminds me of the Dobbertin Surface Orbiter.